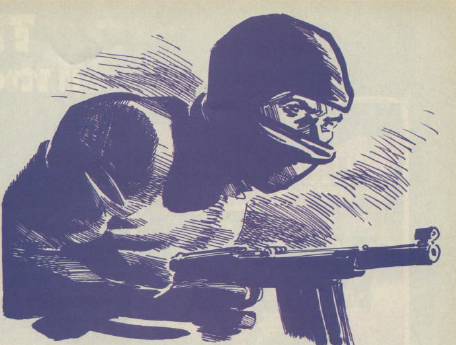 It’s an honour to have Saboteur remembered after three decades! The ZX82 was your first computer you owned – is that your favourite computer or do you have a different favourite? Definitely the Speccy. I liked the idea that you were just given a lump of memory to play with and the rest was up to your skill and imagination. How did you learn to programme? I first started programming on a friend’s ZX81, but only in BASIC. Most of my early programming was trial and error, especially when it came to typing in listings from magazines and trying to debug them. As soon as the Spectrum was announced, I started planning graphics, and soon started writing games of my own. When and how did you realise you wanted to get into game industry? When I had a few games of sellable quality I spoke to a local shop and asked if they’d sell them for me. The shop manager, Tim Hine, said yes – but suggested I spoke to Durell Software. As it happens, he ended up working for Durell too! How did Saboteur come about and how did you approach Durell? Saboteur! was actually a pet project of mine at home. I’d spoken to Durell and they’d asked me to write a game called Chicken – a bit like a Game & Watch game. 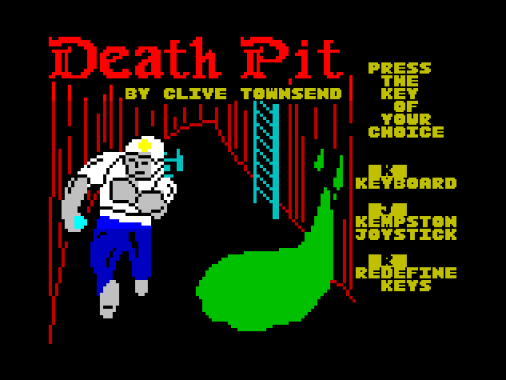 So I started learning assembly language while writing Chicken, but the project was cancelled and I was asked to work on Death Pit instead. Death Pit was virtually finished, but I wasn’t entirely happy with it. Fortunately the boss saw my pet project – then just called Ninja Darkness – and suggested I work on that instead! What is the funniest thing and most frustrating thing that happened to you at Durell? What is the favourite game you have worked on? The Saboteur! Remake is the best game I’ve ever made. It’s about 7 times larger than the original with hundreds of new screens, puzzles, gameplay, and plot. 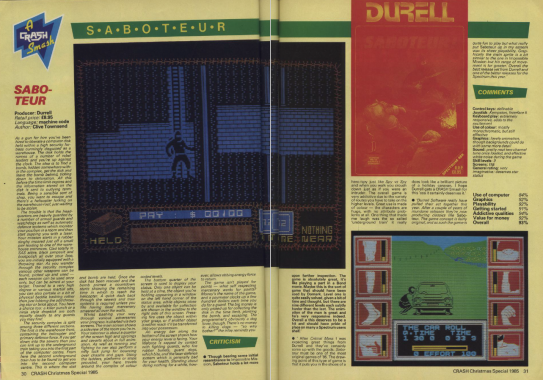 It fills in the gap between the original game and Saboteur 2, and sets up part of the plot for a Saboteur 3. Saying that, I enjoyed working on Thunderbirds for the Game Boy Colour. It’s full of palette and parallax trickery! 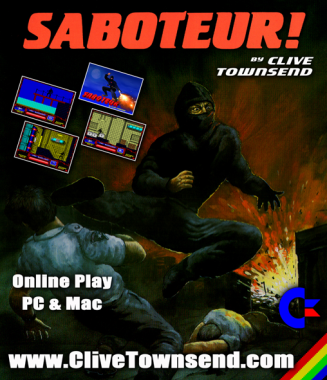 I was a big fan of Saboteur Please to us how you come up with the idea and how you made it? The mid 80s found Ninjas everywhere. My interest in martial arts and spy movies lead me to start designing a rough plot for a ninja-in-a-building type game, and the plot gradually evolved into Saboteur! There was actually more planned – but due to the memory costraints of the Spectrum it ended up being a shorter plot. Over the years I’ve fleshed out the story even further, and now the remake has given me a chance to do it all properly! 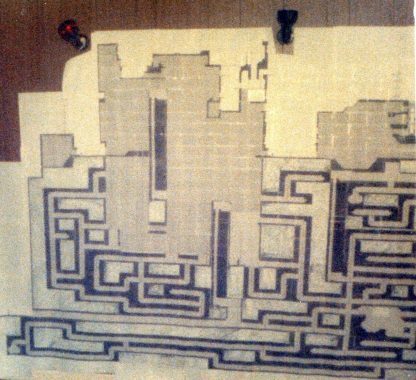 Plans for Sab2 map printed on speccy printer. 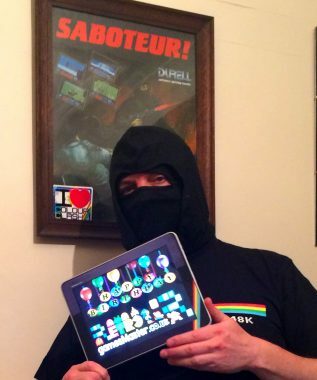 What gave you the idea to update Saboteur on modern devices? Last Christmas was the 30th Anniversary of the original launch. I’ve wanted to make a Saboteur 3 for many years, but now it’s only the retro fans who remember the game. So I thought a remake would reintroduce the brand to modern gamers, and reveal the rest of the plot to the old fans. I’ve managed to replicate colour clash too, so the game (set in 1985) is authentically old school! I’ve done all sorts of jobs – ranging from working as a roofer to teaching gymnastics in a school! Game-wise, I’ve usually worked as part of a team, including the early days of Data Design in the west midlands, Microtime Entertainment in Kent, and Pukka Games in Somerset. 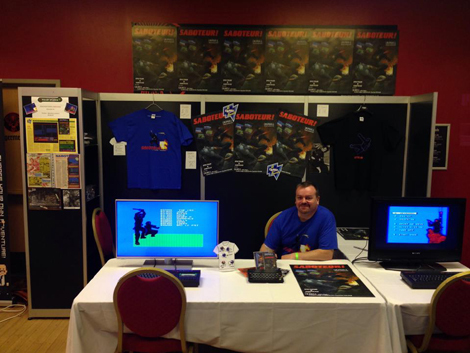 But I’ve made a few freelance games, such as Sonic Jump and Pop Idol for AirplayUK. Tell us what your currently working on? I’ve actually been redecorating my house (currently ripping out the kitchen) so I’ve not done much computer work recently. My main project is called BUD (BangUptoDate.co.uk), an online guide to local businesses. It’s starting to spread! I took 6 months off work to create the Saboteur! remake, which was quite a task. But if there’s enough interest in the remake, then I’ll do the same for Saboteur 2. I agree entirely. At least we have indie games now, so people can still be creative without being part of the corporate games industry. I’ve had most consoles over the years, but don’t really have a favourite. I was disapointed when keyboards disappeared though. We could have lost a whole generation of programmers! But I also loved Cannon Fodder – a great combination of management, action, and fun! Well the original Deus Ex is probably the game I most admire. Great attention to detail. And Chu Chu Rocket was great fun for such a simple idea. I’ve been playing all the Batman games. I’m a big fan, and have all the Batman and Detective comics published in the last 50 years. And the recent games are an excellent addition to the Batman world. Any game where you can’t invert the Y axis. I like ‘mouse’ control for some games, but ‘aeroplane’ controls for others. But I like to be able to choose. On some occasions I’ve bought a triple-A title then given up on it after 30 seconds because they’ve been too lazy to add one menu option and one line of control logic. Well a Saboteur! Remake review of course! Perhaps compare it with the original Speccy version. Or play it in C64 mode. Or Amiga mode. Or Game Boy mode. Or NES mode. Or BBC Micro mode. Or Amstrad mode. Or Atari 2600 mode. Or even ZX81 mode! 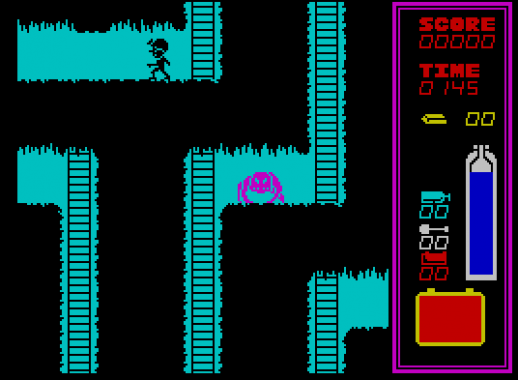 Updated Sab2 graphics, but still in Speccy style.